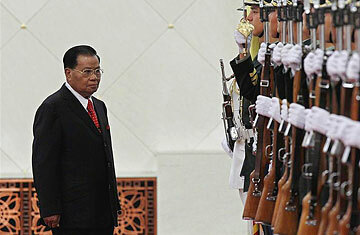 Is Burma's Strongman Really Retiring? More often than not, dictators, like mafia dons, can never retire. It's a rare strongman who can avoid an assassination, coup or revolution and fade into the sunset on his own terms rather than with a prison term. Yet according to members of Burma's newly inaugurated government, Senior General Than Shwe, who ruled the impoverished Southeast Asian country since 1992, has hung up his epaulets and handed over power to chosen successors. Few Burma watchers, and few people in Burma, however, believe 78-year-old Than Shwe has truly called it quits. "The joke in Burma is that Than Shwe has transferred power  from his right hand to his left," said Aung Zaw, editor of The Irrawaddy, an online magazine published by Burmese exiles in Thailand. "He still goes to his office every day. He is still the ultimate authority." After 19 years as head of the country's military regime, last year Than Shwe allowed the first multi-party elections since 1990. He just didn't allow anyone except his hand-picked protégés to win them. Leading opponents, such as Nobel Peace Prize winner Aung San Suu Kyi, were barred from running, and her National League for Democracy party chose not to participate claiming the rules were rigged to ensure Than Shwe's underlings in the military would emerge victorious. U.S. Secretary of State Hillary Clinton called the polls "neither free nor fair," and marred by fraud, repression and intimidation. Though some who are more friendly to Burma's rulers, such as Surin Pitsuwan, Secretary General of the regional bloc the Association of Southeast Asian Nations (ASEAN), have described the elections as a "new beginning" for democracy, other critics have said the transition taking place under Than Shwe closely resembles the faux civilian rule perpetrated by his mentor, former dictator Gen. Ne Win, during the 1970s and '80s. Ne Win had a constitution approved and a parliament of loyalists installed through sham elections. Although he resigned the presidency in 1981 and all political posts in 1988, he continued to pull the strings of power from behind the scenes. He still inspired so much fear that many Burmese would only refer to him as "Number One." It wasn't until Ne Win's family, known for corruption and bullying behavior, allegedly began scheming against some in power that Than Shwe moved against his patron, sentencing his son-in-law and grandsons to prison terms for treason and condemning "Number One" to house arrest until he died in 2002. Few in Burma could have imagined such an end for a man who had wielded such absolute power. Such an end, however, isn't beyond the imaginings of Than Shwe, considering his role those events. As time goes by, Than Shwe's protégés will build their own power bases and may feel more emboldened. He "is aware of the risks,'' said Benedict Rogers, author of the biography Than Shwe, Unmasking Burma's Tyrant. "If enough people in the military, especially at senior levels, decided they had had enough of him, they could turn on him and his family." Than Shwe's ordering of soldiers to shoot Buddhist monks during an uprising in 2007 was reported to have caused some dissension within the military, but he has seemingly managed to keep officers with misgivings in line. Despite widespread poverty among Burma's people, Than Shwe and his family have a reputation for greed and flaunting their wealth. In 2006, a video of the lavish wedding of Than Shwe's daughter, in which she allegedly received $50 million in gifts, circulated in Burma. "The public's disrespect and hatred toward Than Shwe's family members are much worse than for Ne Win's family," said Aung Zaw. Other authoritarian leaders, such as China's Deng Xiaoping and Singapore's Lee Kwan Yew, successfully maintained much of their power and influence long after stepping back from official leadership roles. Than Shwe, who once headed the military's psychological warfare department, has the skills to do the same. "He is manipulative and cunning, and he makes his moves in secrecy," Aung Zaw said. Rogers said that Than Shwe, who often makes public displays of his generous donations to Buddhist temples, keeps at least seven fortune tellers on his staff to help him ward off any ill fortune or plots against him. Yet even they can not predict with certainty what the general's end will be. There is no doubt, however, that Than Shwe's detractors are hoping one of Asia's more enduring religious principles eventually catches up with him: karma. "You reap what you sow," said Aung Zaw.